With Fourth of July now just three short weeks away, chances are that you’re gearing up to have a bit of fun this summer by celebrating with barbecues and fireworks. That’s a sentiment we can identify with because we plan to spend the day lounging in the shade, eating great food, and playing catch with the kids. There’s nothing quite like this time of the year and we wholeheartedly intend to enjoy it to the fullest. 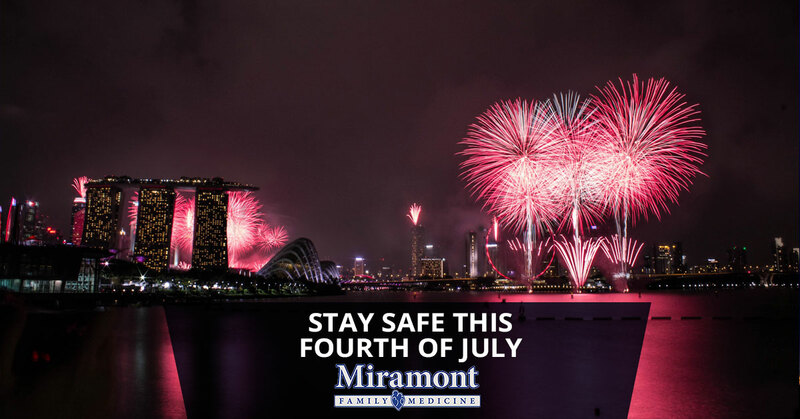 That’s why the team at Miramont Family Medicine has come up with a post that’s all about staying safe during the Fourth of July festivities. There are plenty of opportunities to derail yourself and we feel that making a concerted effort to stay safe and healthy is in everyone’s best interest. So before you gear up for the Independence Day activities, keep reading to make sure you’re prepared for anything no matter what type of fun comes your way! Probably the best bit of advice you’ll get for the Fourth of July festivities (and, to be honest, this whole summer) is to make sure you’re staying hydrated. There are no shortage of charts available online to tell you how much you need to drink for your height to weight ratio, but these can often be inaccurate. Your best bet is to simply carry a water bottle with you wherever you go. Toss it in your backpack and keep it topped off and you will be on the right track. Of course you also have to drink it on a regular basis. One bit of advice we like giving is to take a drink whenever you think of it and listen to your body’s needs. This can be tricky to master, but generally speaking, your body knows what it needs, so be attentive! If your urine is clear, then you’re also in the clear. Not a fan of boring old water? Sparkling water is the answer! With so many options that contain no calories and no sugar, but a dose of natural flavoring, you’re sure to find something that tastes great to you! Whether you’re spending the day out on the lake doing some fishing, boating, or just relaxing or you’re in the yard tossing the baseball back and forth with the kiddos, it’s important to seek shade from time to time. As you can probably imagine, the Fourth of July is one of the biggest times for sunburns for people of all ages. That’s why it’s so important to take frequent breaks from being in the sun and seek out the shade when you can. Of course you can also slather on the sunscreen to stay protected, but there are a number of reasons that you shouldn’t overdo it while you’re in the sun. Combining the protection of the shade with the hydrating benefits of drinking plenty of water is a great way to make sure that you can head back into work on July 5th without regretting your decision. After all, no one likes pulling on a pair of pants over sunburned legs. Better safe than sorry, as the old saying goes. All of this great advice is for naught, however, if you’re overdoing it out there. No matter what the day holds, it’s important that you don’t overexert yourself, causing injury. We mentioned that sunburns are incredibly common during the Fourth of July, but so are injuries. The injuries range wildly in everything from fireworks-related burns to boating accidents to tomfoolery gone wrong. The more focused you are on not overdoing it, the more likely you are to not need x-rays, surgery, or a trip to urgent care. Of course if you are injured, we’ll be here to help, but of course your goal during Independence Day is to relax and enjoy the time you’re spending with family and friends, so make that your focus and you’ll be just fine. Believe it or not, we also see quite a few kids who were dehydrated, sunburned, or injured over the Fourth of July weekend. Yes, kids will be kids, but making it a point to keep track of your kids and monitor them as best you can will always be in your best interest, particularly at exciting times of the year like the Fourth of July. Kids, enticed by sparklers and roman candles, sodas and ice cream sandwiches, can get caught up in the wild and carefree mood of the day, so it’s never a bad idea to get them into the habit of drinking plenty of water and applying sunscreen as necessary. It’s sort of like the “teach a man to fish” example, but we really do believe that if you can reinforce these things as necessary components to your children, they’ll be even more likely to enjoy an accident free Fourth of July. No matter what you’re doing, we hope that you enjoy yourself. So kick back, drink plenty of water, spend some time in the shade, and do your best to enjoy your time off. We know we’ll be doing the same! From the team at Miramont Family Medicine, we wish you a safe and happy Fourth of July! We’ll be here should you need anything with location in Parker, Wellington, and Fort Collins, so don’t hesitate to contact us.